Your backyard shed is full of unwanted objects, and you can’t find the time and energy to clean it out? Better Cleaning Company is a professional rubbish removal Wandsworth SW company that specialises in domestic & commercial garbage clearing and disposal. Contact now - 020 3746 3201. Originally founded as a professional cleaning company, Better Cleaning Company has a great potential to become a leader in rubbish collection Wandsworth market. We have modified the most common standards in the field in correspondence to the latest methods and trends in safe and eco-friendly junk collection. 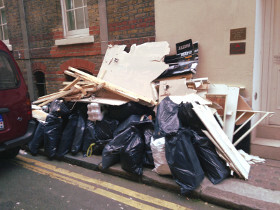 As a result of our hard work, various researches and knowledge of more than 10 years, our rubbish removal services is now one of the best options you've got in London. To complete the mission of junk collection - regardless its type - we have great squads of expert junk removal specialists, who are well-trained and tested. They are fully insured and vetted, ready to deal with any volume and kind of garbage. Please, keep in mind that we deal with any type of rubbish, not including only medical and hazardous products, food and paint. We are seasoned in offering hassle free and rapid garden waste collection Wandsworth SW. We will gather all grass, tree trimmings, hedge, leaves, hay, unwanted plants and weeds, wood and several other garden waste and will load and dispose of it at a reasonable price. Our waste management staff can deal with green waste removal, brown waste removal plus dumping and recycling. Handling building waste is a true trouble if you are not set up with the right instruments, transport and if you have to do it alone. Worry not - we are always ready to provide you professional building waste removal Wandsworth SW according to the laws and regulations. Our service is in particular useful for renovation debris removal and bulky waste clearance. Our staff will do all the hefty loading & lifting of the builders waste. We will help you save time, energy and money for hiring a van etc. If you require assistance with the clearance, disposal & loading of junk and some other unnecessary items, book our effective rubbish removal service at this very moment! As a significant rubbish waste carrier, we have designed a really straightforward booking system for our rubbish removal Wandsworth SW services. Better Cleaning Company has a an efficient hotline 020 3746 3201, available 24/7. You can get a free viewing or directly book our service. We guarantee you rapid arrival. Our skilled two men teams to examine the situation and give you a price quote. We carry all your waste to be recycled in a lawful fashion!